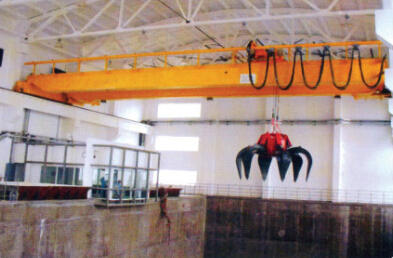 QZ overhead crane with grab，based on GB/T14405-2011 standard, is especially good at hoisting and conveying granular materials such as ore ,limestone，slag，cinder, coal, sand in many indust rial fields, for example metallurgy，cement mining and so on. 1. 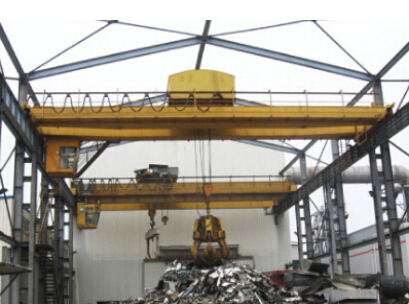 The machine is mainly composed of box bridge travelling mechanism，trolley，grab and electrical system. 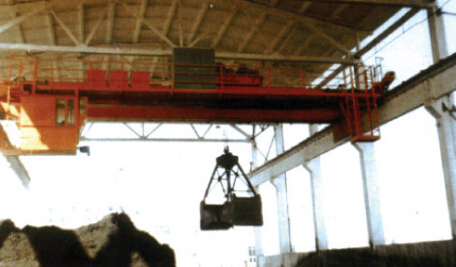 2.Trolley, equipped with two winding drums，has two set of respective drive One is fo r conveying mate rials，the other is for opening and closing grab. 3.Grab has four ropes According to different materials and working conditions，its classification group is divided into light medium and heavy its volume haslM3,1.5M3,2.5M3,3M3for choice. In general Grab is appropriate for granular mate rials through natural accumulation，the dimension of whch is less than 100mm .If underwater mate rials or other special materials are required to be conveyed, you need to point out it in the order. 4. Travelling mechanism adopts respective drive Travelling mechanism and trolley may choose eithe r resistors or variable frequency for speed adjustment. 5.The manipulationis cab’s control，either open or closed.